Spacesaver Eclipse Compactus by Dexion makes powered high-density mobile storage more affordable than ever before. 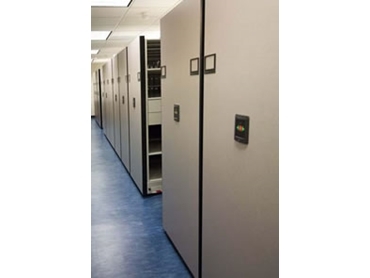 Eclipse Compactus powered systems is the safe high-density mobile storage solution available. It offers high capacity storage with a wide range of intelligent features and options. With its flexible configuration, Eclipse powered systems can be custom built with features and options on a need basis making it affordable. Create your own powered storage solution from a broad range of features and options for guidance and drives, control and safety, power and wiring, environmental monitoring, security lighting and more. Ideal for the bulk storage of documents or items that are frequently accessed or where long-term security is a priority. Simple remove configurability makes it easy to reconfigure Eclipse Compactus once it is installed. And as your storage needs change, Eclipse Compactus can be readily reconfigured to meet them. The Eclipse Compactus powered systems’ modular design allows for easy future upgrades.